You are here: Home » MEDIA » Books » Time Shifters: Into The Past: (Time Shifters Book 1) by Kate Frost (ebook review). Time Shifters: Into The Past: (Time Shifters Book 1) by Kate Frost (ebook review). The heroine of ‘Time Shifters: Into The Past’ is a girl of twelve named Maisie Brown and the story is told from her point of view. When the action starts, she’s on a school visit to Warwick Castle and the class are dressed in mediaeval-style clothes for that authentic feel. Maisie’s best friend is a nice lad called Danny and her worst enemy is an unpleasant girl named Lizzie. Maisie is a farmer’s daughter who loves the countryside, animals and wants to be a vet. Lizzie wants to be an adult and an actress and maybe a reality TV star. She is well-integrated into the modern world and also a bit of a cow. Lizzie is bullying Maisie on the steps down to the castle’s dungeon when the earth shakes. They ascend back to the outer world and find an army getting ready to leave, headed off for battle in the Wars Of The Roses. Maisie spots Danny amongst the ranks of soldiers, looking dazed and confused. She decides they must all stick together, so the girls follow the army. They soon discover that mediaeval life is tough, especially when you have no money to pay for food and shelter. Maisie is better adapted because she’s a hardy, outdoors type. Lizzie is rather a little madam and doesn’t take well to discomfort. Various adventures ensue. After a while, they discover that they have time-shifted and the plot gets more complicated. As in that other British time travel series, ‘Doctor Who’, there’s a lot of running away. I enjoyed it. The characters are well-drawn and develop with the story. The history is soundly researched and the past realistically portrayed. There’s plenty of action and adventure as the tension mounts and the phenomenon of time-shifting is original. It’s also suited to further tales of historical derring-do which explains why this is book one of a series. The novel is good value for money, many pages to the pound and a nice cover. The sages say a super-duper cover design is important. I disagree but a professional-looking cover does indicate that some care has gone into it and that the contents are professional, too. That’s certainly the case here. 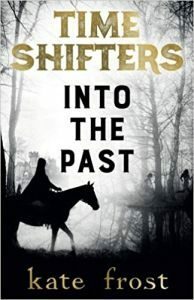 ‘Time Shifters: Into The Past’ is an easy reading page-turner for both young and older adults. « Doctor Who: Paper Dolls by Ben Morris, Simon Guerrier and Christel Dee (book review).